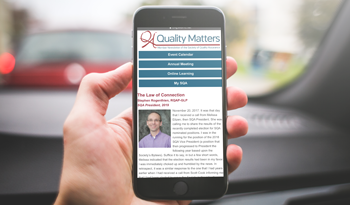 Our members keep up-to-date with current trends, society news and membership benefits through our e-newsletter, Quality Matters. SQA wants to give a big thank you to all the candidates for election this year! Both recommended changes to the SQA Bylaws passed, clarifying term limits for Board members and the requirements for Student membership. Our newly elected Officers, Directors, and Committee Members are as follows. Congratulations!